How well are you meeting the needs of your customers? Can you answer the following questions about your company? What percentage of your customers have had more than one transaction with your company? What factors influence your customers to choose your company? Do your salespeople meet your customers’ expectations? How do your customers describe the service they received from your company and staff? Do your customers want information on any of your other services? WHEN will your customers be in the market for your other services? What percentage of your customers would recommend your company to a relative or friend? Do your customers have family members or friends who would be interested in using your services RIGHT NOW? Continuity Programs 100% turn-key Customer Satisfaction Survey Programs are designed to gather information about your customers’ experience with you, and generate leads for when they will need your services again. Customer Satisfaction Surveys are mailed out with a postage-paid response envelope. Continuity Programs provides Customer Satisfaction Survey Analysis Reports based on the customer feedback, which provides your company with an overview of how your customers perceive your salespeople and company, allowing you to measure customer satisfaction. The Customer Satisfaction Survey Analysis Report is part of a larger Management Summary Report, which allows you to measure performance by ranking your different branches/locations and salespeople and comparing your company’s customer satisfaction rating to national rankings. The Management Summary Report also illustrates with charts and graphs why your customers chose you and what percentage of your customers have previously done business with you. Customer Satisfaction Surveys provide excellent customer testimonials you can share with your affiliate/referral partners and potential new customers. 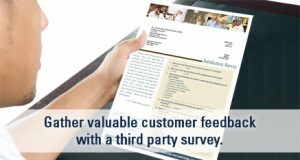 Continuity Programs’ Customer Satisfaction Surveys help you up sell and cross sell and get referrals. Continuity Programs’ Customer Satisfaction Surveys receive a better than 25% average response rate! Call Continuity Programs for details on Customer Satisfaction Survey Programs specific to your industry.